Oh you guys..... I have been asked for a basic roll so many times. I have never made one I loved. I was crackin' through an old 1930's cookbook from my mom recently and found one I thought I would try. 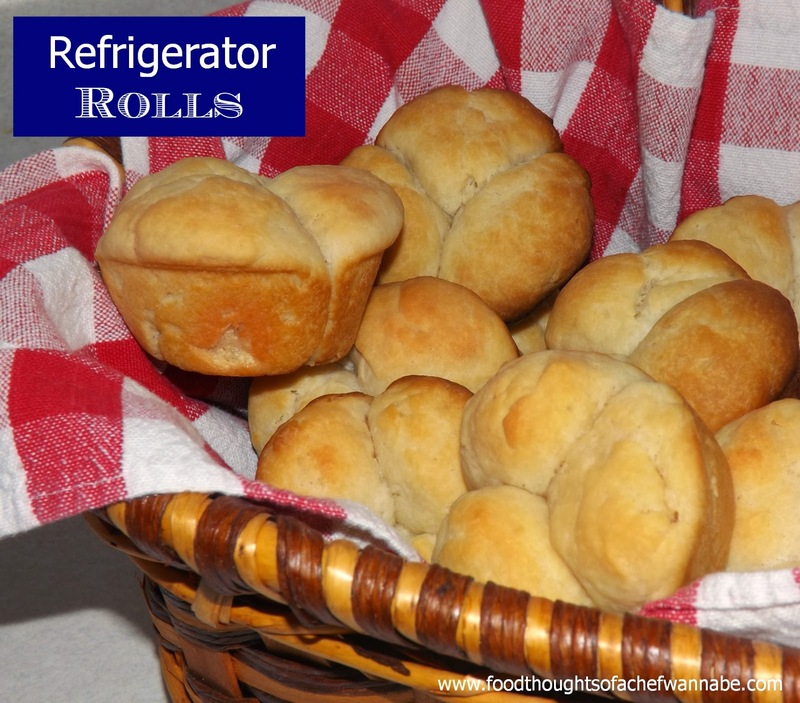 It is labeled just plain "Refrigerator Rolls". In the recipe it says you can (after mixing) put the dough in the refrigerator, covered until ready to use. I gather that is where the "refrigerator" part comes from. Genius, eh? I did refrigerate mine for about an hour while I finished up some other things and was ready to prepare them. Now I have to tell you, these are not my favorite. NOT because they taste bad, they are delish actually, and I love their shape. I am not a biscuit fan. And this roll is the perfect marriage of a roll and a biscuit. Now for some this is a dream, for me, eh, it was OK, and butter and honey made it even better! The flavor is great, the dough is gorgeous and they are as easy as can be. Who doesn't love that old fashioned, homemade shape as well? I have a bad habit of being honest. Who posts a recipe that isn't their favorite? ME! This is a very quick and easy recipe! Make sure to use plenty of butter where it says to and serve warm! Hold on, heeeeeerreeee we go! Combine hot tap water, salt, shortening and sugar in your stand mixer bowl or regular mixing bowl. Add in yeast, egg and flour. (if your bowl is cold it will cool the water enough to not kill the yeast, if you are freaking out, just take the temp, you want it at about 115F). Mix until all ingredients are combined. Now, either put into a greased bowl and cover to refrigerate until ready to use, OR, get rolling! The recipe says it makes 18 rolls. I got 16. This means, you need to roll 48 little balls. When you are done, dip each ball in butter and place 3 into each muffin tin section. Cover with a lint free towel, put in a warm place and let rise until they double in size. Brush the tops with remaining melted butter. Preheat oven to 425 degrees F and bake for 12-15 minutes. Serve these warm with butter, honey, jam, jelly, oh my!! !